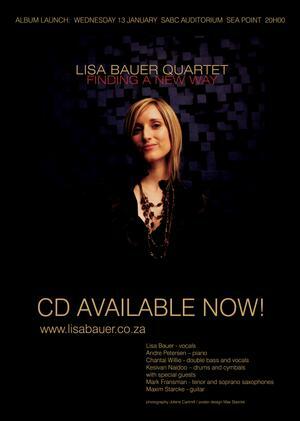 LISA BAUER QUARTET FINDING A NEW WAY NOMINATED FOR A SAMA IN THE CATEGORY OF BEST TRADITIONAL JAZZ ALBUM AT THE 17TH ANNUAL SOUTH AFRICAN MUSIC AWARDS. Recorded at Sound and Motion Studios, Cape Town, 2009. Photography by Jolene Cartmill & Greg Hillyard. Design by Max Starcke. 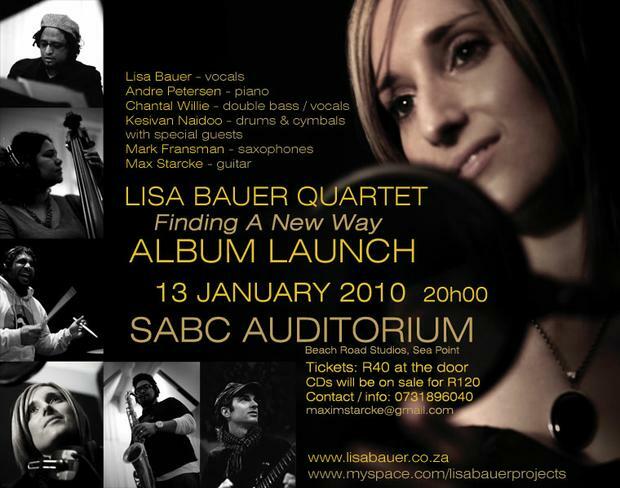 Lisa Bauer Quartet album FINDING A NEW WAY was launched on 13 January 2010 at SABC Auditorium, Cape Town, South Africa! Now on sale at Look & Listen, Musica Megastore, African Music Store, Kalk Bay Books and most fine music stores nationwide or via http://www.jassics.co.za. Soon to be available via digital download. CDs are available for only R150 at www.independentmusic.co.za or follow this link: http://www.independentmusic.co.za/albums/Jazz Signed CDs are available by order via email: lisabmusic@gmail.com and can be posted to your door.